ISSN: 1531-6505; Issue 47 - Subscribe Free! Lot's of great info in this issue (see below), but the big news is the SONAR X3 Power! book is finally here. If you find yourself struggling with Cakewalk's latest incarnation of the SONAR music sequencing software or you want to learn some more advanced tips and techniques, you can now rest easy. SONAR X3 Power! will walk you through all of the new features and changes in SONAR X3. This time around Cakewalk has refined the comping and audio editing workflow and they've added a number of new features. SONAR X3 POWER! is the all-new edition of this popular guide to Cakewalk’s powerful digital audio workstation, offering full, detailed training to help you make the most of SONAR X3. New topics covered include: Comping Record Mode, Comping with the Smart Tool and Comping Tool, Speed Comping, Pitch and Timing Correction with Celemony Melodyne, Custom Track Colors, the new QuadCurve EQ Zoom window, ProChannel Tape Emulator, Tone2 BiFilter2, Nomad Factory Blue Tubes Analog TrackBox, Nomad Factory Blue Verb DRV-2080, Addictive Drums, AAS Strum Acoustic Session, AAS Lounge Lizard Session, and much more. 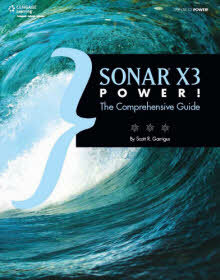 In addition, the SONAR X3a, b, c, d, and e updates are included in this new edition. You can find more information, a table of contents, a preview, and discount purchase links at: http://www.garrigus.com/powerbooks.asp. And for those of you who are continuing to use SONAR X2, my SONAR X2 Power! book is also still available. I want to give a special thanks to all those who pre-ordered SONAR X3 Power! and have already posted nice reviews about the book up on Amazon. Thanks to: Thomas E. Sullivan "Psalmist7", Clinton Hoerner, S. Rosenthal, microapp, W. Kraft "djwayne", Gary VanderHaeghe, Ian Myers, J.M. McLean, Steve Murray, and BV. If I missed anyone, let me know. Thanks very much! I appreciate your support. And now I need even more nice reviews... pretty please? If you have already purchased SONAR X3 Power! and would like to post a review on Amazon, please visit one of the following links ( Amazon USA - Amazon CA - Amazon UK ) to go to Amazon. Once there, click the Create Your Own Review button. Thanks! Thanks for reading DigiFreq and enjoy the rest of the issue! In addition to all the great deals listed there, you can get even more great deals at the MusicTechShop. Get great deals on music software, music gear, musical instruments, and more. You can even get deals on just about any product on the market. 1. Select a region of audio and then using the Track view menu or by right-clicking the audio, choose Region FX > Melodyne > Create Region FX from the menu. A new Region FX clip is created (displaying the RFX logo in the upper-right corner) and named Melodyne. The Melodyne window (see Figure 11.10) is also automatically opened inside the MultiDock. The RFX logo displayed in the upper-right corner of the clip can be clicked to access a menu that provides a number of functions. Bypass Region FX toggles the Melodyne effect on the clip off/on so that you can compare the original to the processed audio. Remove Region FX completely removes Melodyne and leaves you with the original audio unchanged. Open Editor opens the Melodyne window. I'll explain the Follow Host Tempo and Copy MIDI Events functions later in this section. 2. The Melodyne window displays the Region FX clip within the Editing pane. Along the top of the pane is the Time Ruler (which is the same as and synced to the Time Ruler in SONAR's Track view). Along the left of the pane is the Pitch Ruler, which displays pitch values shown as names of musical notes. Along the bottom and right of the pane are the Horizontal and Vertical Scroll bars. Drag the center of the bars to scroll the pane. You can also click the Scroll Right/Scroll Left and Scroll Up/Scroll Down arrows to scroll the pane. In addition, you can click/drag the pane with the Scroll tool or hold Ctrl while dragging with the Main tool. If you'd like to make the Editing pane larger or smaller, right-click the Melodyne tab in the MultiDock and choose Undock to float Melodyne in its own Window. You can now resize the window for a larger or smaller Editing pane. 3. For zooming, use the Scroll bars and Zoom tool. Click/drag the top/bottom ends of the Vertical Scroll bar to zoom vertically. Click/drag the left/right ends of the Horizontal Scoll bar to zoom horizontally. To zoom out all the way (thus fitting the entire clip in the Editing pane), double-click the center of the Scroll bars. To zoom in on a specific area, use the Zoom tool. Click/drag up/down and left/right to zoom vertically and horizontally. You can also hold Ctrl while using the Zoom tool to temporarily switch to the Scroll tool so that you can move the display for pinpointing the area you want to zoom. Using the mouse wheel, you can scroll and zoom with any of the available tools. Move the mouse wheel up/down to scroll vertically. Hold Shift and move the mouse wheel to scroll horizontally. Hold Ctrl and move the mouse wheel to zoom the area that is centered on the mouse cursor position. 4. Without a data selection, Melodyne parameters make changes to the entire audio clip. To edit only a portion of the notes in the display, use the Main tool and click/drag within the Editing pane to make a selection. To select all the notes in the clip, right-click in the Editing pane and choose Select All. You can also select all notes of a certain pitch by clicking that pitch in the Pitch Ruler. 5. Use the Main tool to edit the notes. I'll talk more about editing in the following sections. In the meantime, you can copy, cut, paste and delete selected notes by right-clicking and choosing the appropriate command from the menu. 6. Choose Edit > Undo or Edit > Redo from the Melodyne menu to deal with mistakes that you've made during editing. You can also press Ctrl+Z (Undo) or Ctrl+Shift+Z (Redo). 7. To control playback, use any of the tools and double-click in the Time Ruler to start playback at that point in the clip. Click once more in the Time Ruler to stop playback. Using the Main tool, you can also double-click in the background of the Editing pane to start playback and double-click again to stop. You can also toggle playback by pressing the Spacebar. During playback, you'll notice a cursor moving across the Editing pane. This cursor is the same as (and synced to) the Now time cursor in SONAR's Track view. Although playback in Melodyne and SONAR are synchronized, it doesn't take tempo changes into account. If you have tempo changes in the same area of your project where the Region FX clip resides, you can have playback in Melodyne follow those changes. In SONAR, right-click the Region FX clip and choose Region FX > Melodyne > Follow Host Tempo to toggle this function. 8. If you have notes selected, the Editing pane will not scroll but project playback will continue. Click in the background of the Editing pane to remove the selection and start scrolling. By default, the Editing pane scrolls during playback. If you'd rather not have it scroll, choose View > Auto Scroll from the Melodyne menu to toggle playback scrolling off/on. 9. To loop playback (called cycling in Melodyne), click/drag horizontally in the Cycle Range area of the Time Ruler to define a loop (or cycle) range. Once defined, you can adjust the range by clicking/dragging inside the range to move it or clicking/dragging its ends to change its size. To toggle cycling on/off, double-click inside the defined range in the Cycle Range area. Since this same playback loop is also defined in the SONAR Track view, you can press L to toggle cycling (looping) as well. When creating/editing a cycle range, you may have noticed the ends snapping to specific positions on the Time Ruler. This happens because of the Time Grid, which I'll be talking about in the following sections. In the meantime, to temporarily turn off the Time Grid, hold Alt while dragging in the Cycle Range area. 10. Click the Compare button to temporarily turn off all Melodyne processing so you can compare the sound of the original audio to the Melodyne processed audio. 11. When you're finished, close the Melodyne window (or just close the MultiDock). When you play your project, the Melodyne processing will be played as well. 12. To open the Melodyne window and make additional changes, just double-click the Region FX clip. You can also right-click the clip and choose Region FX > Melodyne > Open Editor. 13. To permanently remove any Melodyne changes, right-click the Region FX clip and choose Region FX > Melodyne > Remove Region FX. 14. To permanently apply any Melodyne changes, select the Region FX clip and choose Clips > Bounce to Clip(s) in the Track view menu. Keep in mind that this will permanently overwrite the original audio so you will not be able to get it back. For more advanced information about working with Melodyne in SONAR, check out Chapter 11 in SONAR X3 Power! Go to: http://www.garrigus.com/powerbooks.asp. Mogami / Canare cables or NOT? Thanks for reading DigiFreq and I'll see you on the forums! Copyright 2014 by Scott R. Garrigus. All Rights Reserved.